Founder Rou Gu Cha Cafeteria is a first-generation family business, with 65-year-old Mr Chua as the pioneer. He grew up in a pig farm and so had first hand knowledge about which pig parts were suitable for cooking bak kut teh, greatly aiding him in his venture to cook this dish. A lover of this traditional dish, Mr Chua began this business in Jurong in 1975. When he first started, an ordinary bowl of bak kut teh at $4, one with pork ribs at $5; topping it up with a bowl of rice would cost an extra 50 cents. Founder Rou Gu Cha Cafeteria was voted the most popular bak kut teh in the Readers’ Choice Favourite Hawkers Poll in the year 2008. Food lovers, both tourists and locals, queue as late as 10pm to savour this mouth-watering dish. The shop can sell up to more than a hundred kilograms of pork ribs on an average day. 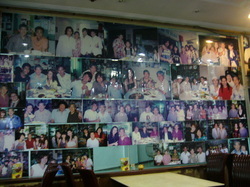 Photographs of numerous renowned celebrities from Hong Kong, Taiwan and Singapore enjoying their bak kut teh can be found all over the restaurant. To show that he was the creator of this cooking style, Mr Chua chose the name “Founder” or 发起人 in Chinese. Mr Chua’s bak kut teh is Teochew-styled, as the soup base tasted better as the spices were not overpowering and also because it sold better than Hokkien-styled ones. The specialty of the dish is that he uses fresh ingredients and controls the flavour of the soup. He puts little herbs into his bak kut teh, with only pepper blended into a powdery form. He uses the spare ribs found at a pig's hind, which turns white after cooking and is more pleasant to the eye. Ribs at the front of the pig are red and turn black after cooking, which is unappealing to customers. As the Balestier area was known for its bustling night activities, Mr Chua chose to set his shop here to boost his business. His customers come from all over the world, making his business very prosperous. For the older generation, this dish serves as one of reminiscence; for the younger generation, this dish is a sumptuous meal. Either way, this bak kut teh greatly attracted not only many locals and foreigners but also both young and old. Despite his age, Mr Chua does not take a back seat. He still continues to cook at the restaurant, but allows his children to do the cooking sometimes under his monitoring. Excluding rice, a standard serving costs $5, while a serving with pork ribs costs $8. The meat portions are above average and one gets to savour the delicacy in air-conditioned comfort. There are two types of pork ribs to choose from: the longer ones, and the smaller, chopped-up ones. The meat of the former, with a satisfactory amount of fat, is extremely soft and literally slides off the bone, making it a favourite among the patrons. Customers can choose to consume the bak kut teh with either rice, mee sua (longevity noodles) or you tiao (deep-fried bread dough). Some prefer mee sua because it absorbs the flavour of the soup, making the dish more delectable. Other choose the homemade you tiao which is made saltier to complement the bak kut teh. This restaurant sells a wide variety of side dishes for customers to choose from. The tau pok (fried bean curd) is cooked in rich salty gravy. Customers especially love the rich soya sauce-based gravy oozing out when they bite into the tau pok. With a tinge of sweetness, the preserved Chinese mustard is topped with much chopped garlic and very well-loved by most customers, who find the degree of saltiness manageable. The restaurant also sells braised pig’s trotters, the meat especially succulent and tender, melting instantly in one’s mouth. The magnificent flavour of the soya sauce gravy further boosted the deliciousness of this side dish. Pig innards, including pork liver, stomach, kidney and intestines are available to customers to add into the soup, making its flavour stronger. Vegetable, such as tang oh (garland chrysanthemum), and other side dishes, including tau kee (bean curd strips) topped with sauce, is also on the menu. To complete the meal, homemade barley is also available to quench one’s thirst after enjoying a bowl of bak kut teh. Mr Chua is planning to hand over the business to the next generation, and his children are making plans to set up another branch around the same area, so as to cater to a greater clientele, such as customers from tour groups, which they are currently unable to handle because of their limited shop floor area.